Using the microwave on HI will cost about 1/8 to 1/4 of a cent to operate for 1 minute. Using my gas cook top will cost about 1 cent for 5 -7 minutes (this includes preheating time for skillet). If I had an electric cook top, it would cost about 1 & 1/2 cents, for 5 -7 minutes of cooking. So, we won't retire early on these savings, but every penny counts. and I'll save time making my breakfast (takes about 1 minute per egg -- which allows me to get on to the pleasure of eating, much faster -- happy tummy!). Place the butter into microwaveable container. Melt on HI for 20 seconds (just till melted). Add milk, or water, and egg. Scramble with a fork, in the container. Microwave on HI for 20-25 seconds per egg. The egg will be puffy in some places, but still uncooked in others. Stir cooked portions into uncooked, with fork. Microwave on HI another 25 to 30 seconds, per egg. Top with cheese, if desired. Allow to stand for a minute while you chop your veggies. Use a rubber spatula to scoop the egg onto plate. Add remaining toppings of your choice and enjoy! These eggs are really so yummy and quick. They can be taken on the go, in a flour tortilla, on an English muffin, or between 2 slices of toast. Or, for a Sunday brunch treat -- top an English muffin half with a slice of Canadian bacon or ham, the microwaved egg, some cheese sauce (easy to do in the microwave, too) and chopped chives. I don't drink milk, so I scramble my eggs with water, and they still turn out fluffy and delicious! Everyone has their own favorite toppings for eggs. 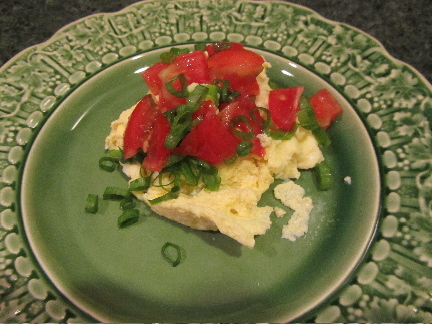 Mine are chopped green onions and tomatoes. Do you cook in your microwave very much? An interesting technique, thanks for sharing. I am not a microwave cook at all, mine is used primarily for reheating leftovers, melting butter, heating an individual cup of water. I think most Americans just use the microwave for heating foods and beverages. And they are incredibly handy for that. I didn't cook in my microwave much either, until a few years back, when we were having some work done on our kitchen. I had a temporary kitchen set up in the hallway, and found I could use my microwave for many foods. I like to put a slice of ham or Canadian bacon in the bottom of the bowl I'm cooking in and put the egg on top of it. None of the egg sticks making clean up easier. Cooking takes about a minute this way in my microwave. Sometimes there is a little raw egg that has to be moved to the edges to cook a bit more and sometimes there isn't. That sounds delicious! Can't wait to have ham in the house, again, to give it a try. I used to make microwave eggs all the time but gave up on it because there would be egg residue literally welded to the sides of the bowl and it took both soaking and scrubbing to get it clean. That was before I got a decent dishwasher though, so maybe it would be different. Have you had that problem? I wouldn't scramble eggs in the microwave if it stuck to the container. It's one of the things I like about this method for doing eggs. Some people swear by non-stick cooking spray. I swear by melting butter in the container before adding water and egg. I use 1 teaspoon of butter for every egg I'm doing (I only cook 1 or 2 eggs at a time). 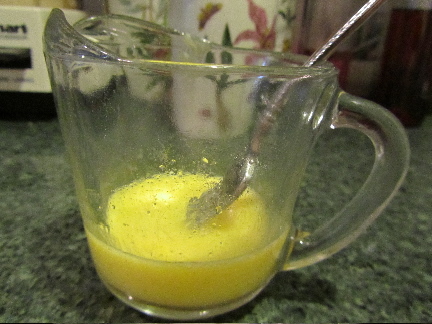 I melt the butter first in the cup, then add the water and egg, and beat. I microwave partially, then stir, and finish cooking. I think the eggs come out very slightly undercooked, and set up in the minute or two that I'm chopping veggies. 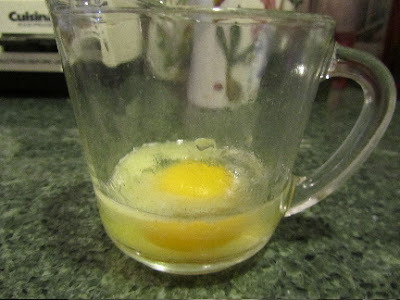 I then use a rubber spatula to scrape/scoop the egg out of the cup or dish. And right away I fill the cup/dish with cold water. I just let it soak while I'm eating. Then I just wipe it out with a wet dishrag and sometimes a little soap. It's practically clean at this point. I suppose I could finish washing the entire cup right then, but I'm lazy, so put it in the dishwasher. Don't put egg-y things in the dishwasher without rinsing very well with cold water first. The heat of the dishwasher cooks the egg onto the container, before the water spray can rinse it off. So, questions for you -- do you spray your bowl or melt butter in it first? Do you add water to the egg (keeps it all wetter)? And do you scrape out the bowl and put on a plate, or eat from the bowl? The times that I've eaten right out of the mug, I've had more egg residue to clean off, than when I scrape/scoop it onto a plate. And for clean-up, do you soak the bowl immediately? If you do all these things, then I'm stumped why it works for me and not you. Live and learn says she likes to line the bottom of a bowl with ham slices, to keep her eggs from sticking to the bowl. Well, to be honest I haven't microwave an egg in years. But given what you've said here I'm pretty sure I did everything wrong. I don't recall ever adding oil, butter, milk or water... the only thing I might have added would be cheese, which would probably have added extra welding properties to the equation. I'm gonna try your method, 'cause it would be really nice to be able to whip up a quick breakfast without having to deal with the skillet etc. If you try microwaving scrambled eggs again, I hope you have better results with the clean-up. My spouse's eggs always turn out much better than mine because he scrambles them in the microwave - they never dry out that way, and he likes the quick clean-up. So now I only use the stove top for making omelettes! They come out fluffier, don't they?! And I like that there are no overdone edges, as when I do them on the stove. When I was a (vegetarian) teenager I lived with my grandparents for a few weeks and my grandma used to make me microwave scrambled eggs a lot, since she didn't know what to feed a vegetarian! They were great though. I may be doing this this week, since my gas bottle for my stove is empty and my landlord won't be back until Wednesday to replace it. For your Grandma, this was probably a really easy way to fix the main protein part of your meal. I'm sure that she found it really great to not have the skillet and mixing bowl to clean up afterwards!